I saw Minority Report this weekend. 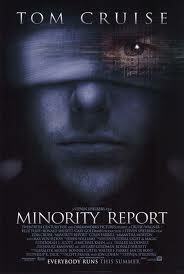 Since I liked the last Tom Cruise movie Vanilla Sky , I thought I might like Minority Report too, even though the quality of a movie has far more to do with the director than the lead actor. But alas, Minority Report is a mediocre, derivative, sometimes incoherent film, straining after metaphysical significance but falling into banality and queasy humor — straining after a brilliant vision of the future but falling into just another D.C. political-intrigue thriller. The premise of the film raises serious metaphysical and moral questions: If the future can be seen, then are all of our actions determined in advance? If we are determined, then how can we be held responsible and punished for our actions? How can a person be guilty of a crime he has not yet committed? By what right do they keep three clairvoyants hooked up to machines and prevented from leading a normal life? A film that dealt squarely and plausibly with these issues would have been really significant. But they just hover in the background and are never taken seriously and addressed in a coherent way. All we get is some pretentious patter, which may impress morons but convicts Spielberg as a phony in the eyes of the intelligent. Does the movie ever really prove that we have free choice? Or is the clairvoyant Agatha’s insistence on freedom proved wrong, since things do end up happening exactly as she saw them? How does knowing the future allow us to change it? If it can be changed, then it cannot be known. If it can be known, it cannot be changed. By not addressing these questions, the film does not establish a coherent, believable world. It lacks moral and metaphysical focus. This lack of focus is especially clear when one asks oneself if this is supposed to be a dystopia or a utopia? The police search of the public housing building, with its little Matrix-derivative spiders, is pretty horrific. The eye-scanner technology is shockingly invasive. The police act like jack-booted thugs. The form of imprisonment is also shocking, especially for the claustrophobic. But in the end it all falls flat. Spielberg never really takes a stand. Because of the void at the center of this movie, it slowly implodes under the weight of all its meaningless sci-fi trappings. Instead of making a coherent, serious film, Spielberg tries to keep us amused with an old sub-B movie technique: the running gag. This running gag is designed to wring nervous laughter from us. It involves eyeballs. Tom Cruise has to get a new set to evade security. So he visits a sleazy doctor with snot running out of his nose, and his sleazy assistant, who just comes out of the toilet. We cringe that these people are about to perform surgery. Spielberg adds a lot more touches of the weird and the grotesque: the old woman in a greenhouse full of carnivorous plants who plants a kiss on Tom Cruise for no apparent reason, the old woman smoking a pipe in the hotel lobby (pure Lynch), the hollow eye-sockets of the drug dealer, the creepy caretaker of the clairvoyants, the crippled custodian of the prisoners, the mole on the face of the nurse, etc. All of it falls flat, though, because the grotesque too presupposes a particular metaphysics to make sense. As Flannery O’Connor tells so brilliantly and David Lynch shows so brilliantly, the grotesque has no metaphysical weight in the modern world-picture, where all evils can be explained and ameliorated. The grotesque is precisely that which cannot be explained by science and ameliorated by technology and liberal politics. The grotesque shows that there is moral dimension that lies beyond science’s and technology’s capacity to predict and control. But Spielberg never takes a coherent stand on precisely this question, so his grotesque gestures fall as flat as his science fiction futurist ones. The character of John Anderton played by Tom Cruise is also problematic. I hate the vulgar psychoanalytic understanding of motives that is such a staple in Hollywood. Why does John Anderton join the department of pre-crime? What’s his motive? Well, he was traumatized by the disappearance and presumed murder of his son six years before. He’s in pain. So he tries to prevent future crimes. (The disappearance also destroyed his marriage, but for some reason he did not go into marriage counseling.) Then he goes home at the end of a long day and relives his past with his son and kills the additional pain with illegal drugs. I frankly do not understand how rapidly he rejects the whole pre-crime concept when he finds that he is going to commit a murder. Was he not convinced of its infallibility before? If so, then why does he not even consider turning himself in? His conversion is too radical and is unsupported by anything established about his character. It certainly proves his commitment to pre-crime to be unserious, which does not make him a hero in my book. And why the hell does he shave his head at the end of the film and show off his ugly brachycephalic skull? I just don’t care about this guy. I just don’t care about Tom Cruise. I have seen better-looking men walking down the street every day of my life. And he’s not such a great actor. Am I missing something? The racial politics of this movie are absurd. The very idea that all the would-be killers arrested in a six-year period in Washington, D.C., would be white is so preposterous that when the prisoners were displayed — and I saw no non-whites among them — I actually heard a couple of nervous, stifled sniggers in the sold-out showing I attended in Berkeley, P.C. capital of the universe. Those problems aside, however, there was something unusual about the racial politics of this film. First of all, one of the laws of casting against type is to find attractive (i.e., white-looking) Negroes for positive roles. But the most prominent blacks in the film are really hideous and primitive-looking. Then there is the Semitic-looking sicko who cares for the three clairvoyants in their isolation tank. Then there is Tim Blake Nelson as the creepy crippled custodian of the futuristic prison who plays Bach on a cheesy-sounding organ to soothe his prisoners, who are kept in some sort of suspended animation in glass pods. (How did Spielberg know my idea of hell?) Then there is the truly hideous Jason Antoon (picture Gene Simmons without the makeup), who is portrayed as sleazy even though he helps our hero Tom Cruise. Antoon’s character is named Riley, while the very handsome Irishman Colin Farrell plays a character named Danny Witzer. No comment necessary there. And finally, the man who pretends to have kidnapped and killed Tom Cruise’s son is played by another Jew, Mike Binder. There are three Swedes cast as villains: Max von Sydow as Lamar Burgess, as well as the eye surgeon and his nurse. But the lead positive roles were played by whites or by people who look white: Tom Cruise’s character, his wife, the clairvoyant Agatha (played by Samantha Morton), the old woman in the greenhouse, and Colin Farrell’s character Danny Witzer. The other two clairvoyants also seemed like Nordic types. One of the cops also looked like a product of the Lebensborn program. If I haven’t convinced you to skip this movie yet, then consider this: The ending makes no sense. The pre-crime program is shut down when it is on the verge of going national. But how did anything in the film justify shutting it down? A better question would be how they justified setting it up in the first place. And how did they manage to confine the clairvoyants’ powers to the Washington DC area for six years? Isn’t six years a bit long for a pilot project? How did they propose to broaden the clairvoyants’ powers to the entire nation? Are the clairvoyants free at the end, or just prisoners of a different sort, with lots of nice books to read? With crap like this to work with, it is no surprise that John Williams’s score is pretty undistinguished as well. And it is the best part of the film! Don’t waste your time and money on Minority Report.